The Women's Castle site was created after we noticed a gap in the market for good quality websites for women. Then, using the research that was available to find what women were interested in, we decided to make a user-friendly website that was fast and easy to learn. We also needed something to empower and motivate women with things they felt were their own. The focus of the website is all women aged between 14 and 50. Of course anyone with a taste for the feminine will find this sight of interest. One of our micro sites that is already proving to be very popular is 'The Hairstyler'. This innovative website allows you to choose your hairstyle from over 3,000 different styles. It's a virtual hair design site. After uploading your picture you can mix and match until you find your desired combination. Then you print out your result and take it along to your hairdresser. This minimizes the margin of error. No more sitting in the chair and describing what you want and then coming out with a hairstyle completely different. You can even choose from celebrity hairstyles! Mint's innovative hair designs and expert colour work earned them the title of runner up state winners in the L'Oreal Colour Trophy, which is one of the most prestigious competitions in the world. 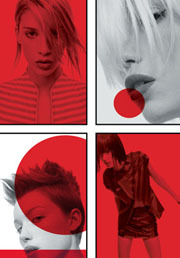 Mints award winning work has appeared in international fashion and hair magazines such as Marie-Claire. The salon continues to provide top-level hair care to Port Melbourne. Your experience in-salon will leave you feeling rejuvenated, rewarded and refreshed. Not just hairdressers but rather hair consultants. They will consult with you about your look and lifestyle and work with you to create a hairstyle to suit. They believe that the 'ultimate' hairstyle is unique to each person and your hairstyle will suit both your face and your image. Time is a factor in everyone's lives and that is why Beau by William uses the new and exciting technical breakthrough in hair colour. LUOCOLOR is a 20 minute colour service, capable of producing the closest reflection of hairs natural luminosity. Splinters Hairdressing is arguably one of Melbourne's most sought after hair salons, with its team of highly qualified cutting and coloring specialists, all with years of experience. Splinters is situated in the heart of Toorak Village. With its French Gothic decor, warm Tuscany Lemon interior plus technologically advanced lighting for specialty color work, Splinters makes having your hair styled a most enjoyable and unique experience. As a professional salon a blow wave or style cut is recommended after all colour, high lighting and foil work and straitening services. As you can see we have a lot of great sites. Why don't you come and have a look inside a Woman's Castle? We think we have every thing a pampered lady needs. Women's Castle provides all the sites that a women could need. The front page is made up of the most popular websites that women use, covering a diverse range of subjects such as hairstyles, movies, Women's health issues and easy access to the weather report. We then listed a number of magazines that are very popular with women and added sports that have a big female following. The subsequent pages are laid out in alphabetical order with varying subjects on each page, including a smattering of subjects that are not stereotypical of women. Enjoy.